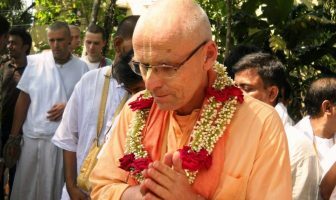 In the last week of Kadamba Kanana Swami’s stay in Durban, there were three significant programs. 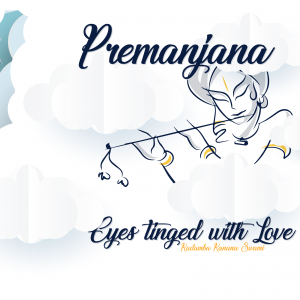 On Friday, 15 April, on the special occasion of Rama Naumi, Maharaj attended the evening program at the New Jagannatha Puri Temple where he gave a lecture in glorification of Lord Ramachandra. On Saturday morning at 10:30 am, an initiation ceremony took place at the Durban Temple. And on Saturday afternoon a very special event took place. 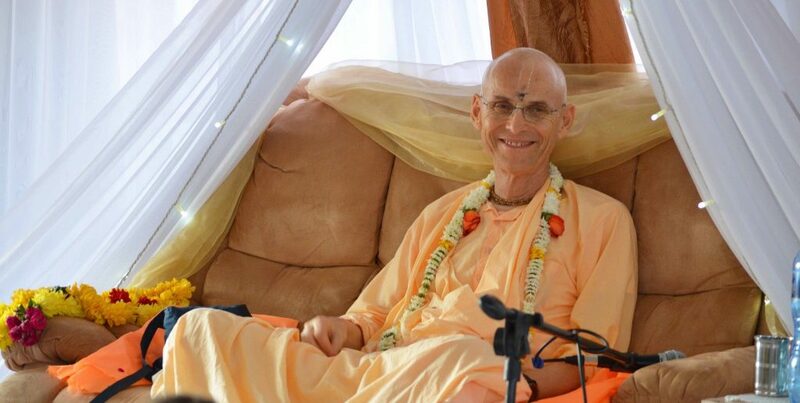 Disciples from all over South Africa congregated in Durban, at the house of Parjanya Prabhu, Archa Murti Mataji and Candrasekhara, to celebrate Kadamba Kanana Swami in their lives. Please find a description of the event below. On Tuesday (19 April), Maharaj travelled to Radhadesh in Belgium for the celebration of Vyasa Puja. 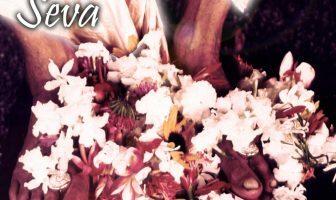 This function of Vyasa Puja, where we are once a year honouring the spiritual master, is a collective function. It is a function where we come together. It is a function where we can give each other strength – we share some of our higher ideals, some of our doubts, some of our weaknesses, some of our struggle and some of our sorrows. We also see how different devotees find their inspiration. I’ve often said, “What to do?” Some people think those three words came from me but they didn’t. 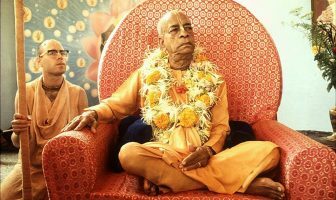 I learnt them from Bhurijana Prabhu… then just out of the blue one day he wrote me a letter that said, “I finally answered it!” and he said, “Do something.” I thought about that answer for a long time… There is a point. We must do something to the best of our ability. In the end, it is not just about good intentions but it is about what we do… The recent months were a bit intense in terms of the fast moving, overwhelming events. Some people might describe it as a roller coaster experience and the “What to do?” question came up. And the answer I came up with is the answer I like the most: Rise to the occasion. Whatever may come, rise to the occasion! Because this, “What to do?” expresses the powerless position that we are all in in the material world. Sooner or later, we come to the situation where we just feel overpowered. What to do? My answer is: Rise to the occasion. Let this be our guiding principle. It should be firm friendship in the relationship with the spiritual master… the essence is that it must be based on trust. Trust means that we can be open and honest and that we know that no matter what, the spiritual master is our ever-well-wisher. No matter what we do, he will not reject us. He will continue to be our well-wisher. Just like being a parent. A parent is an unconditional well-wisher (supposed to be)… No matter what the child does, it’s still your child… The spiritual master is our ever-well-wisher. He will never withdraw his mercy. It is true that in the beginning, when I first became a spiritual master I had so few disciples. I had so much time for each of them and they became very close to me, very intimate. Now it may not be like that – not that same kind of time spent together, not that same personal exchanges… For that, those who are my older disciples should also share with others. Everyone is sent by Krsna to fulfil a role. It is not that everything is going on by a system and everyone gets the same treatment and the same opportunity. No! Everyone is sent by Krsna to fit into the plan… Some are meant to be strong. Some are meant to be exemplary. Even sometimes I can see in a new person that still they are meant to be like leaders. Immediately, they are meant to be examples and others they may struggle and struggle… For those who are strong by nature, please carry others. For those who are weak, please take shelter of others. We are doing it, collectively. No one is strong all the time… Let us go back to Godhead in this life-time; that is the idea. So I’m sitting here this evening to bring us together, in that commitment. And I am ready to give every individual his space for his character but there is no room for maya, of course. And whatever maya comes in, I am understanding but when I’m only understanding and holding your hand then I’m cheating you because Krsna will keep you in the material world for your maya… I understand you can’t finish your rounds. You are tired. But Krsna wants pure devotional service. Krsna wants surrender! And when personal weakness is there, take more shelter. The problem is not our personal weakness; the problem is we don’t take shelter… At the end of the day, we have to take advantage of the opportunity and embrace purity… Thus our understanding of what purity is becomes refined and we have to embrace it. That is actually the purpose of our relationship, the purpose is our purity to live a life according to the will of Krsna. I wrote letters to you asking for some privacy besides explaining my situation because I could not just put in all that energy which I have for all these years. For the last 20 years, I have travelled 4 million km and I have many, many times given two, three sometimes four lectures a day. I have met with so many people. I think that was the madhya lila. I think it is over now… Now, it is the beginning of the antya lila. Exactly what the antya lila will look like and how long it will be, that is up to Krsna. So, for a little while, I was on death row… I was thinking, if I would die now… the one regret was that I didn’t finish my books. This is something really lacking… To actually write some proper books because I think those books will live beyond me. That is what I want to focus on now coming out of this experience – to produce something substantial. It is time for change. But not for a change in our relationship as guru-disciple… That will remain… Rather those relationships should also be deepened. I’m going through the motions of what being in the material world is like for all of us. I have a material body and it goes through the motions. Whatever circumstances will come about, I will rise to the occasion, that is my determination! As far as my relationship with you all is concerned, ultimately it has to come to quality from all sides. It is the quality which counts. 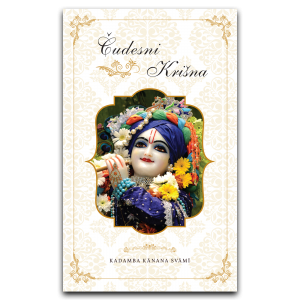 From my side, I have to rise to the occasion of really going deeper and deeper in my relationship with Krsna and then sharing that with you as a spiritual master and you have to rise to the occasion of being serious devotees, on your own initiative. Conquer the weakness. And when personal weakness is there in following spiritual standards, take more shelter. He gazed with eyes that spoke… prayers maybe? We would like to acknowledge the following devotees who took audio recordings and photos while Kadamba Kanana Swami was in Durban: Nimai, Vibhu Caitanya Das, Merumala dd and Naimisaranya dd.